I’m sure if people talk about this page, they’ll be talking about the final panel. As much as I worked and tried to get that panel to “pop,” my favorite panels are the first two. As a consumer of entertainment, I really like the moments that really show a character in an honest, believable light. I feel in those first two panels, we’re actually getting a clear look into Boss Fleming’s thought process. It’s a nice contrast against the guy we saw at the hat shop or picked Long John up from the sheriff––nothing but testosterone and bravado. But here we get to see a different side, and even though the end of the chapter is right around the corner, I really wanted to get this moment in here. That “quiet time” for Fleming isn’t something I planned from the beginning––it wasn’t one of those visualizations I had and knew I had to get to. Instead, when laying out these last few pages, some space opened up where I actually took out a short scene of Fleming shooting (non-fatally) the sheriff because he stepped out to defend Long John. 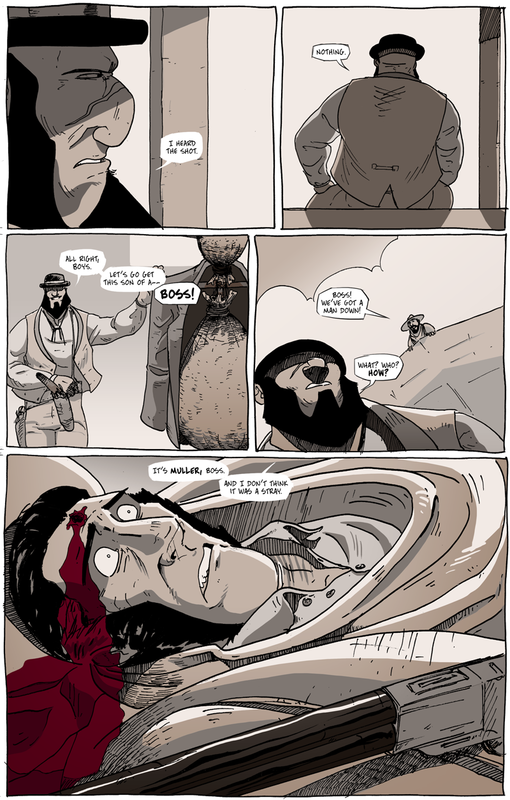 With panels getting shifted around, I had some space at the top of this page, and I knew exactly what I wanted to do. Not all characters can be round, but you can offer rounding moments, something that shines light on a contradictory or unexpected side of things that––despite any contradictions––make the character seem like rather normal (for being a complete monster, otherwise). I didn’t imagine Fleming as a man with incredible depth. He’s a wolf in sheep’s clothing, a lumbering creature that is trying to hide his animalistic nature behind shiny shirts and funny hats, a dandy brute. In a story that could have easily painted him (and did, for the most part) as a raging psychopath, I’m glad that the opportunity to turn Fleming a bit in the light presented itself (and it was a much better idea than the first thought). With the incognito ring-leader taken out of the game, Poverty Flat faces a much different day when the sun rises in the morning. And that’s all I’ll say.